They were on display during celebrations in Kryvyy Rih. 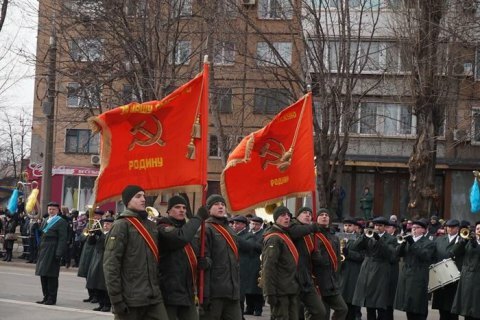 The commander of the National Guard, Col-Gen Yuriy Allerov, has ordered an internal investigation into the use of Soviet flags during a parade in Kryvyy Rih, according to the Interior Ministry's website. On 22 February, this central Ukrainian city celebrated the 74th anniversary of its liberation from Nazis with a parade which featured military vehicles led by a T-34 tank. Two trios of the National Guard walked along its central street under the red flags. One of the flags was saying "For our Soviet motherland" while the other one had the Soviet symbols of a hammer and a sickle, which are banned under the 2015 law banning Communist and Nazi symbols. Exceptions to the law include the original combat flags and tombstones. General Staff denies "two-three suicides a week"
Klimkin on Putin's Crimea arms idea: "We will not undermine our position"